This story is one of the most familiar stories in scripture. Anytime a huge underdog goes up against a favorite and prevails, references are usually made to David slaying Goliath. I suspect it is one of the most shared stories in children’s Sunday School Classes and Vacation Bible Schools. It is part of a strain of literature that runs throughout scripture that uses exaggeration to focus on important truths. Stories like Balaam and his talking donkey and Jonah and the whale and David and Goliath use bigger than life circumstances to tell great truths. In this story, the writer places a great word picture in our mind. Two mountains on either side of a valley with the Philistine army on one side and the Israelite army on the other, readying to do battle. But before either side initiates the battle, a warrior emerges from the Philistine camp. According to the writer that eventually put this story in permanent form after it was told around the campfire for many generations, Goliath was 9’6” tall. He wore a shirt of bronze that weighed 175 pounds and he carried a spear – which the head alone weighed 25 pounds. In comparison, poor David was small in stature. When King Saul put his armor on him to prepare him for battle, David was immobilized by it’s weight. I suspect that every time the story was told, Goliath got a little bigger and David got a little smaller. I think by telling the story this way the storyteller wanted us to know that each one of us would have times when we face a problem or a challenge that is far bigger than we are. Every morning for forty straight days, Goliath emerged from the Philistine camp and challenged and taunted the army of Israel. And I imagine every day he looked bigger and more formidable to the Israelites. Which I think is a second characteristic of Giants that the storyteller wanted us to understand and that is that the longer the giants in our lives go unchallenged, the larger they become. King Saul, the leader of the Israelite Army, was not a small man himself, but he did not believe that he was any match for Goliath. And so he offered a reward which consisted of the equivalent of millions of dollars in the currency of the day, and his daughter in marriage, and no taxes for life to anyone who would take up the challenge, but there wasn’t anyone in the Israelite Camp who had the courage to accept the reward. And so every day, for forty days, the Israelites would endure the taunts of the Philistines and at night they would retreat into their tents and wrestle with their fears and anxieties, and in the morning they reluctantly emerged from their tents, and took up their positions, with their resolve even more minuscule and the giant even more formidable. You see, the truth about giants is that they don’t defeat us as much as we defeat ourselves. There was no one in that Israelite camp that had ever gone up against Goliath, much less suffered defeat by his hand. The only evidence that they had to his great power and abilities was by Goliath’s own testimony. Often the greatest weapons of the giants that we face are our own fears. When we are confronted with the problems and difficulties and challenges of life, they don’t begin as giants, but are often blown out of proportion by our own fears and anxieties. There are so many times that I go to bed at night with a problem on my mind that I need to confront and by the time I spend the night tossing and turning and wrestling with it all night in my mind, by morning it has grown way out of proportion. It’s become a giant. One pastor, commenting on the Goliath dilemma says this: each of us has some kind of giant facing us. A giant is anything that steals our joy or limits our effectiveness as a Christian disciple. Your giant could be a marriage that is troubled or an illness that is threatening your life or a personal habit that is destructive. Your giant could be a job situation that is unfulfilling or a difficult boss or an impossible financial situation. Your giant could be a temptation that is almost impossible to resist. Maybe your giant is the threat of cut backs or downsizing at work. Perhaps your giant is loneliness or grief. If you are a student, perhaps your giant is a person or group at school that you don’t get along with or your inability to communicate with your family. Every body faces giants of some size.” And I think that one of the points that the story of David and Goliath wants us to understand is that giants left unchallenged will not go away, in fact they will grow bigger and bigger and bigger until all that we can see looming before us is that giant. As you look into the coming year, what are the problems and challenges that you face that will grow to giant like proportions if left unchallenged? So on the fortieth day, a father – Jesse – calls his teenage son who was tending the sheep far removed from the action. “Your brothers are on the front lines of the Israelite army facing the Philistines and they are running low on provisions. I need you to take them some supplies and then hurry back. You can’t leave the sheep unattended for long, lest they be killed by the predators that are always seeking to devour them.” And so David grabs the provisions and sprints towards the front lines. And when he arrives he sees this giant man, standing in the valley, weapons at the ready, challenging and taunting the army of Israel, who are cowering on the mountain top above. And on the opposite mountain the Philistine army, shouting words of encouragement to their champion, knowing that without the giant standing in the way, the army of Israel would defeat them as they had all the other peoples who occupied the land. And when David sees that none of the Israelites will fight Goliath, he says “what will be my reward if I fight and defeat the giant.” And his brothers are angry, and the army is amused, and the King is skeptical. King Saul tells David that he can’t possibly defeat the giant. Don’t even try. Several years ago, I sat in a hospital waiting room with the mother and father and fiancé of a young woman, just graduated from the University of Kentucky, getting ready to step into an exciting life of teaching and marriage. Seemingly a great life just on the horizon. But she had been experiencing a great deal of pain and discomfort in her abdomen and when the tests did not reveal the cause, the doctor decided to do exploratory surgery to see if he could determine what was going on. We had settled in for a long day of waiting but instead it was less than an hour when the surgery was over and the doctor was talking to us. As soon as they opened up the young woman they discovered that she was eaten up inside with cancer, and though the pathology would take some time, he was sure that it was a very aggressive form of cancer for which there was no effective treatment. All we can do at this point, he said, is try to keep her comfortable for whatever time she has left, which will be less than three months. It was devastating news. Later we all gathered around the young woman in the recovery room. Tears. Faces etched in fear and despair. And her father asked me to have a prayer. And I really did not know what to say in the face of this giant. But I stepped forward, and before I prayed I said to them, and these were God’s words not mine, “You know that the doctor’s words are never the final words – that what really matters is God’s word. We need to place our trust in His word alone.” And then I prayed for the presence of God’s Holy Spirit and that He alone would speak His words of life into each of our hearts at that very moment. And He did. Despair turned to resolve. And for the next several months that young lady, with her family at her side, fought that giant with every tool in the arsenal. And three months passed, and then six months and almost one year to the date, it was my privilege to preside over the wedding of that young couple. And she started her teaching career and a couple of years later it was my joy to baptize their baby. I wish I could say that the cancer never returned but it did. But not until that 3 month prognosis, turned into several years of living her dreams. You see, the Israelites were stopped in their tracks because they chose to listen to the giants rather than God. Giants will only prevail if they are successful in making people forget God. 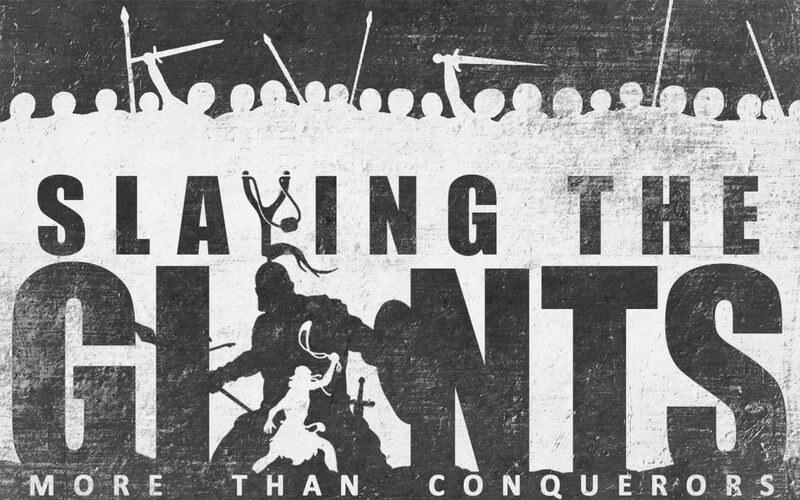 Just as the Hebrews had forgotten God and let the giants turn them away from entering into the promised land, now generations later, the Army of Israel comes up against the army of the Philistines and Goliath, and they immediately forget how God has led them every step of the way in the conquest of the land. So often the giants that we face cause us to forget that God is always with us. The only voice they heard was that of the giant. And then this young shepherd boy, small in stature but a giant in terms of His faith came to the Israelites and reminded them whose they were. I love how one commentator put it when he wrote: There was a tremendous difference between where David was looking and where everybody else was looking. In other words the Israelites were all looking towards the giant, but David was looking towards God. The Israelites say to David, “What are you looking at boy? Don’t you see how big, how brutal, how strong this man is”. And David replies, “I have faced giants before who threatened the livelihood of the sheep, and with the Lord’s help, prevailed. This Philistine Giant taunts the people of God, and just as he has delivered me from giants before, He will deliver me from the hands of this Pagan giant.” The commentator goes on to say: The hot topic of conversation with everybody else was Goliath, but the hot topic with David was God. For people of faith it is always God that has the last word – not the giants. But when you forget what God has done for you in the past, you will doubt what God will do for you in the present and in the future. Scared and without hope, the armies of Israel saw David as a ninety eight pound weakling, but God saw him as a faithful giant who towered over Goliath. David prevailed, not because he fought for God, but because he trusted God to fight for him. On his own David could not defeat Goliath, but his faith assured him that with God, there were no giants that could ever defeat him. In the coming year, all of us will face our own Goliaths. For some of us it will be a bad medical diagnosis. Cancer or some other potentially debilitating illness. Some are already facing that giant right now. For some our giant will be a shattered relationship. For some it will be the loss of a loved one – grief is a giant that at some point we must all deal with. For others, our giant may be financial difficulties – the loss of a job, or some other setback. And I dare say that all of us will face the twin giants of sin and temptation in the days ahead. And I know that the church will continue to face many giants in the coming year. There continue to be financial giants in our path. There is an increasing indifferent and secular culture that rises up as giants standing in the path of the army of God, and there will be grumblers in our midst who if we allow their voices to rise above the Word of God will become giants. The church faces many challenges today that threaten to stop us in our tracks and even cause us to turn back, if we focus on the challenges and forget the grace and providence of God. But I believe the story of David and Goliath has one message above all others. And that is that all of us – are meant to slay the giants. Perhaps the Apostle Paul said it best when he wrote to the church at Rome: If God is for us, then who can stand against us? Who can separate us from the love of Christ? Will hardship, or distress or persecution, or famine, or nakedness, or peril or sword. (All giants in their own right). No in all these these things we are more than conquerors through Him who loves us. For I am convinced that neither death, nor life, nor angels, nor rulers, nor things present, nor anything to come will be able to separate us from the love of God in Christ Jesus our Lord.